Our unique Chemistry Services team combines a knowledge of process chemistry and analytical skills to provide detailed chemical characterisation of pulp and paper mill processes and products. Our team has the expertise to analyse samples from the furnish, pulping, bleaching, recovery, recausitcizing, paper machine, effluent and other areas of mills. We utilise a Quality Management System that meets, as a minimum requirement, ISO/IEC 17025 standards and are accredited by the Canadian Association for Laboratory Accreditation, Inc. (CALA) for specific tests. We employ wet chemistry, liquid and gas chromatography, ICP, FTIR and other analytical techniques across the breadth of Pulp and Paper mill processes and products. Typical test usage and targets are indicated, although many procedures are broadly applicable as required. Talk to us about your needs. For services to determine scale type (eg Burkeite Na6(CO3)(SO4)2, Pirrsonite xCaCO3 • yNa2CO3, Limestone CaCO3) refer to Contaminant and Unknown Identification. Where applicable, FTIR Spectroscopy and Microscopy in conjunction with other techniques may be applied. Samples such as solids, powders, liquids, extractives, plastics and rubbers from industrial and other sources can be interrogated to determine composition using one or more of the FTIR techniques listed below. Pulp and paper products and process components, deposits, ash, contaminants, additives, coating materials etc. are analyzed frequently. The microscopy techniques available are well suited to micro amounts of material (eg from tape pull). Core tests are presented according to the most common applications, and in addition to this we maintain an extensive testing library. Contact Client Services to discuss your requirements. Our pilot plant and bleaching labs can process a wide range of materials, from non-woods (grasses, bamboo, agricultural residues) to wood species, arriving in whole form or pre-chipped. Our sample preparation, wood chip testing, pulping and bleaching equipment and capabilities are extensive. Therefore we would encourage any interested parties to contact the Pulping and Bleaching manager for a more thorough description of our capabilities and how we can help with your custom project. 20-liter circulating liquor digester – simulates continuous or batch kraft, soda-AQ, sulfite (acid and alkaline), kraft liner, low energy batch simulations (i.e. RDH®, SuperBatch®), alkali profiling cooks (i.e. MCC, EMCC, LoSolids cooks), and pre-hydrolysis studies using steam, water, or acid. Uses up to 4000g od sample per cook. Benefits include most reliable yield data, customizability (additives may be applied during cook, separate layers in digester), and larger pulp sample typically allows for brown and bleached strength studies. 6-liter and 1-liter bomb digesters – simulate batch kraft, soda-AQ, high kappa kraft, and custom projects. 6-liter bomb uses up to 900g od sample, 1-liter K-bomb up to 120g od sample. Benefits include multiple cooks completed simultaneously in oil bath (up to three 6-liter bombs, and six 1-liter bombs), small sample size needed, excellent method for isolating unknown conditions, and the sealed nature of the bomb digesters allow for very high pressures. 12-inch laboratory refiners – Atmospheric refiner with interchangeable plates and patterns, available for running basic mechanical pulping studies, determining wood brightness from chips, or breaking apart fiber bundles in high kappa cooks. Standard bag bleaching – Any atmospheric bleaching stage, temperature controlled by water bath. C, D, E(p), P, X, Y, Q, A, Paa, etc. Typical sample size is 300g od pulp, however smaller samples may be used. Pressurized stirred reactor – Used for O, Eo, or Eop stages. Sample size required: 300g od pulp. Custom-designed reactor preserves strength of pulp while simulating conditions. Note: All bleaching stages report residual chemical and brightness or kappa. Optimization of low kappa pulping parameters necessary for production of ECF and TCF pulps. Evaluation of new fiber sources, including non-wood or other sustainable fiber supplies. Assessment of pulping additives prior to mill implementation. Layered cooking of chips to determine economic benefits of chip thickness screening. Evaluation of mill chip supplies for pulp yield and strength. Evaluation of TCF bleaching sequences for wood or non-wood applications. Development of low-AOX and dioxin-free bleaching sequences. Increasing ECF production capacity through peroxide and xylanase applications. Dissolving pulp bleaching, optimization, and preparation of client samples. Quantification of increased bleaching costs caused by carryover. Determination of the impact of bleach plant modification on chemical consumption, pulp strength and effluent properties. Development of modified bleaching sequences to optimize bleach plants. Our Pulp and Paper Testing Group can evaluate a wide range of physical, optical and printing properties, as well as perform tests related to various pulp treatments. We ensure rapid turnaround of test results to help our clients resolve problems quickly. Our test methods follow industry accepted procedures such as TAPPI, PAPTAC, ISO and SCAN. We maintain our high standard of accuracy and precision by conforming to a Quality Assurance Program that includes regular participation in collaborative pulp and paper reference monitoring programs. Microscopy is an indispensable testing discipline for the pulp and paper industry. The primary application is fiber analysis, which provides detailed evaluations of wood species and pulp type in pulp, paper and wood samples. Non-wood and synthetic fibers can also be profiled microscopically. In addition, our microscopy department can provide valuable assistance in process troubleshooting. Defects and contaminants can be profiled and identified by microscopic techniques. Includes percentage breakdown of species and pulp type. We can identify all common North American hardwoods and softwoods. Our team is also experienced with samples from Europe, South America and Asia. 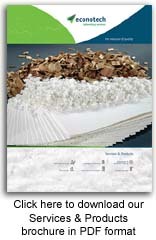 Analysis of sawdust and powdered products is also available. Track variations in hardwood/softwood content. Determine chemi/mechanical pulp content in blended products. Individual wood species and non-wood fibers (grasses, cereal straws, synthetics, etc.) Synthetics can be specifically identified by FTIR techniques. Determines the relative amounts of hardwood vessel elements between pulps within a batch of samples. Vessels can also be categorized by size or observable damage. Photomicrographs can also contribute to this service. An in-house method utilizing our digital camera and monitor tools to measure a minimum of 150 fibers for their average diameter and cell wall thickness. In conjunction with a Domtar shive analyzer, we determine sclereids/OD gram in pulps, positively identifying sclereids from other interferences. Total sticky area and count. Reported as total count of stickies and as total surface area of stickies per 100 OD grams of sample. Total ink count and total ink area. Count and measure ink particles recording largest, smallest and average ink particle size. General microscopic examinations identify pulp and paper contaminants like shives, bark, sclereids and foreign material like plastic or synthetic fibers. Chemical characterization is further available by FTIR techniques. Photomicrographs are often a useful addition. A digital camera mounted on our Nikon E400 microscope with 4x through 40x objectives provide detailed photographs of your sample. The images can be very useful in demonstrating what has been observed at the microscopic level. Photomicrographs are used in many applications including general fiber qualities, embedded contaminants, line defects, print quality and for marketing purposes. Econotech is experienced in the highly-specialized production and testing of dissolving pulp grades. Our experience dates back to the founding days of Econotech, when in 1972, we acquired the lab facilities and equipment of Columbia Cellulose, a manufacturer of dissolving pulp. Our unique skills and facilities enable us to simulate the production of viscose or acetate grades of pulp and provide detailed information on their properties. Laboratory scale preparation of alkali cellulose is followed by aging to a specified end point target viscosity. Xanthation of the alkali cellulose results in the formation of viscose. The viscose is dissolved in alkali with further aging resulting in a viscose solution simulating that used in the production of rayon. Both the slurry and sheet steeping procedures may be used. In addition, should sheet steeping be assessed, the procedures used allow for the determination of capillary rise, sheet flotation, caustic absorption, swelling volume and density. In addition, phase contrast microscopy can be used to photograph the product and to determine the population of un-acetylated or partially acetylated fibers and the presence of particulate impurities. A micro-scale preparation of viscose using a 0.5g sample of pulp. Test includes: Pulp sample preparation and conditioning, alkylation/xanthation, followed by cellulose regeneration as a measure of pulp reactivity. All samples are completed in duplicate. At the mill, every penny counts. In a highly competitive global market where energy and chemical costs are at a premium, you scrutinize every aspect of your operations to reduce costs and gain a competitive edge. The lime kiln is one of those areas. Overburning deactivates lime and wastes energy, while underburning elevates deadload and reduces recaust efficiency, again resulting in waste. Stable production of high quality lime is key. How well is your lime kiln performing? To understand how well your lime kiln is working, you need to have a measure of product quality. Residual carbonate in reburned lime is a primary indicator that can help operators tune their kilns to avoid under- or overburning. Econotech’s RLA enables operators to regularly test and monitor residual carbonate through the day, supporting a stable and efficient kiln operation. Our RLA tests 2.00g of lime, making it easier to obtain a representative sample. Large samples also make the results less sensitive to weighing error and produce more CO2 for better measurement accuracy. 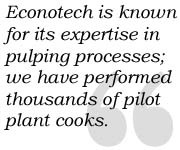 Econotech’s RLA was redesigned after extensive customer consultations. The result: a practical new design, improving on accuracy and robustness. Improved Accuracy – Percent calcium carbonate is read directly from the RLA’s calibrated burette, which incorporates a validated offset to account for gas expansion due to heating. Consistently adding the same amount of acid is easier with an innovative design including a simplified auto-pipette and control valve system. Corrosion Resistant – Almost all metal has been eliminated from the updated design. Glass and polymer components also provide excellent corrosion resistance. Its durability gives way to a longer service life and lower maintenance in harsh mill environments. Easy to Use – Fewer critical testing steps mean easier operator training to achieve consistent results. The leveling bottle is attached to the stand and can be adjusted and locked into place/unlocked with one hand. Durable screw-in reaction jars make it much easier to secure and properly seal, reducing errors and jar breakages. Safer – Acid bottles are now completely secure with no loose tubing to catch on. Acid is also contained during the reaction, eliminating any concern of spillage. Compact – RLA’s smaller footprint only requires about one square foot of bench space. Visit our dedicated RLA page. Econotech now offers Reburned Lime Reference Material. Each 2.0-gram sample comes with a Certificate of Analysis. These samples provide an easy way to confirm that your RLA is giving you correct results and is a useful tool for training staff on the consistent operation of the analyzer. Copyright 2019 Econotech Services Ltd.